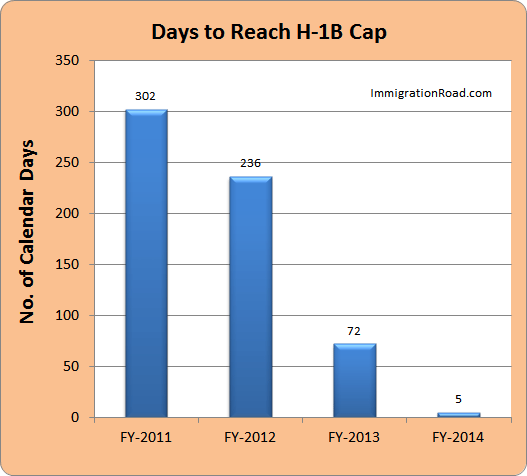 Here is another way to look at how quickly the annual H-1B cap has been reached over the past four years. In 2010, the annual cap for FY-2011 was reached 302 days after the season started on April 1st. This year, it took all of 5 days to do the same. According to USCIS, approximately 124,000 H-1B petitions were filed this year. 85,000 of them won the lottery and if approved, their beneficiaries will be able to work in H-1B status starting October 1, 2013. For people who didn’t win, or missed the boat altogether, the earliest time they may begin working in H-1B is October 1, 2014, assuming they win the lottery next year. Not a good situation for foreign tech workers seeking better opportunities in the U.S. This entry was posted in USCIS, Visa. Bookmark the permalink.